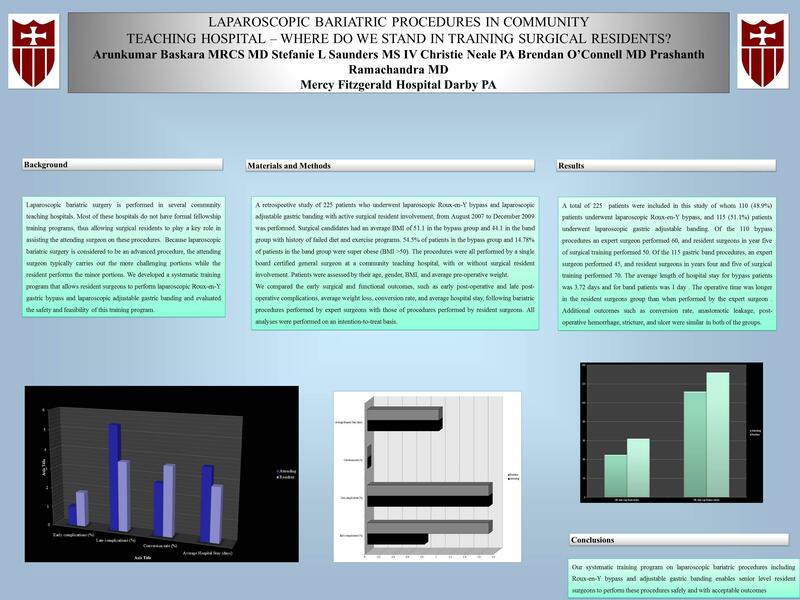 Laparoscopic Bariatric Procedures in Community Teaching Hospital – How Far Are We Into Teaching Surgical Residents? Laparoscopic Bariatric Surgery is being done in several Community Teaching hospitals. Most hospitals don’t have formal fellowship training and surgical residents play a key role in assisting the Surgeon for these procedures and in most centers, major part of the procedure are being done by the attending Surgeon and residents do minor share of it as these procedures are considered as advanced laparoscopic procedures. We developed a systematic training program that enables resident surgeons to perform laparoscopic Roux-en-Y gastric bypass and laparoscopic adjustable gastric banding and evaluated the safety and feasibility of this training program. A retrospective study of 215 patients was performed who underwent Laparoscopic Roux-en-Y bypass and Laparoscopic Adjustable Gastric Banding, with active surgical resident involvement, from August 2007 to December 2009. Surgical candidates have an average BMI of 44.1 in the band group and 51.1 in the bypass group with history of failed diet and exercise programs. 54.5% of our patients in bypass group and 14.78% of patients in band group were super obese (BMI >50). All the procedures were done by single board certified general surgeon at community teaching hospital. Patients were assessed by their age, gender, BMI, average weight of the patient pre-operatively. We compared the early surgical and functional outcomes, like early post -operative and late post-operative complications, average weight loss, conversion rate, average hospital stay, of bariatric procedures performed by expert surgeon with those of procedures performed by resident surgeons. All analyses were performed on an intention-to-treat basis. A total of 225 patients were included in this study of whom 115 (51.1%) patients underwent Laparoscopic Gastric adjustable banding procedure and 110 (48.9%) patients underwent Laparoscopic Roux-en-Y bypass procedure. Of the 110 bypass procedures 60 were performed by expert surgeon and 50 by resident surgeons at year 5. Of the 115 gastric band group 45 were performed by expert surgeon and 70 were performed by resident surgeons at year 4 & 5. The average BMI in band and bypass patients are 44.1 and 51.1 respectively. 60 patients (54.5%) in our bypass group were super obese (BMI >50). Our maximum BMI in the bypass group is 79.9. The average length of hospital stay for band patients was 1 and for bypass patients was 3.72. The operative time was longer in the resident surgeons group than in the expert surgeon. The other outcomes like conversion rate, anastomotic leakage, bleed, stricture, ulcer were similar in both the groups. Our systematic training program on Laparoscopic Bariatric procedures which include Roux-en-Y bypass and adjustable gastric banding enables senior level resident surgeons to perform these procedures safely during residency with acceptable outcomes.